40:1 The Lord spoke to Moses: 2 On the first day of the first month you shall set up the tabernacle of the tent of meeting. 3 You shall put in it the ark of the covenant, and you shall screen the ark with the curtain. 4 You shall bring in the table, and arrange its setting; and you shall bring in the lampstand, and set up its lamps. 5 You shall put the golden altar for incense before the ark of the covenant, and set up the screen for the entrance of the tabernacle. 6 You shall set the altar of burnt offering before the entrance of the tabernacle of the tent of meeting, 7 and place the basin between the tent of meeting and the altar, and put water in it. 8 You shall set up the court all around, and hang up the screen for the gate of the court. 9 Then you shall take the anointing oil, and anoint the tabernacle and all that is in it, and consecrate it and all its furniture, so that it shall become holy. 10 You shall also anoint the altar of burnt offering and all its utensils, and consecrate the altar, so that the altar shall be most holy. 11 You shall also anoint the basin with its stand, and consecrate it. 12 Then you shall bring Aaron and his sons to the entrance of the tent of meeting, and shall wash them with water, 13 and put on Aaron the sacred vestments, and you shall anoint him and consecrate him, so that he may serve me as priest. 14 You shall bring his sons also and put tunics on them, 15 and anoint them, as you anointed their father, that they may serve me as priests: and their anointing shall admit them to a perpetual priesthood throughout all generations to come. 10:19 Therefore, my friends, since we have confidence to enter the sanctuary by the blood of Jesus, 20 by the new and living way that he opened for us through the curtain (that is, through his flesh), 21 and since we have a great priest over the house of God, 22 let us approach with a true heart in full assurance of faith, with our hearts sprinkled clean from an evil conscience and our bodies washed with pure water. 23 Let us hold fast to the confession of our hope without wavering, for he who has promised is faithful. 24 And let us consider how to provoke one another to love and good deeds, 25 not neglecting to meet together, as is the habit of some, but encouraging one another, and all the more as you see the Day approaching. God's promises are like seeds planted in a "brown and empty" world. To the unbeliever, what seems so barren will one day be busting with life and beauty and joy. So don't give up on God, ever, even in the midst of your pain. Instead, Pray in faith, because you are forgiven. 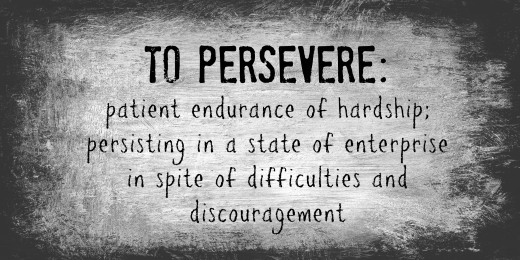 Persevere with hope, because God is faithful.